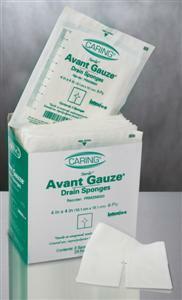 Caring Drain Sponges: Superior fenestration more closely hugs drain tubes, keeping tube sites drier.6-ply, rayon/polyester fabric provides maximum absorbency and low linting. Pre-cut sponge eliminates the need for sterile scissors and conserves nursing time. 4" x 4", 6 ply.